Sabotaging the Syrian Withdrawal? | Inside the Eye - Live! Inside the Eye – Live! 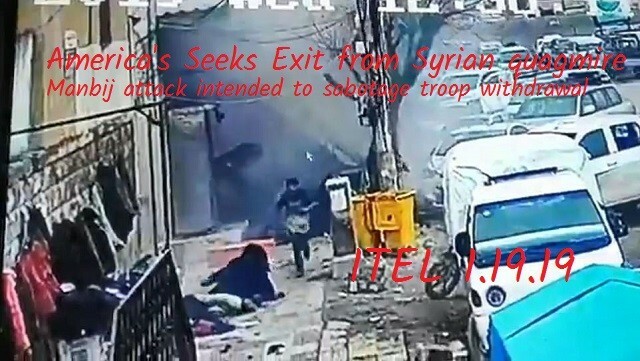 for Saturday, January 19, 2019 focused on the seemingly endless Syrian quagmire that sees the US military sent into a hostile environment as Syria without a clear (public) mission which this past week saw a very public loss of 3 US soldiers and their US citizen interpreter killed in a powerful “suicide bomber” attack. With Trump’s announcement of a troop withdrawal from Syria, some have speculated that this very visible attack on 3 intelligence related personnel in Manbij, Syria, was designed to reverse Trump’s decision. Now to be fair to the discussion, Trump has largely been a failure in foreign policy in the Middle East. This should be expected as Trump is not serving American interests, and his advisers are all Israel-first policy wonks. So while Trump might be said to have ordered a troop withdrawal, Trump has also increased troop deployments in Syria 5 fold since taking office. The troop increases in Syria got to be such a sore sticking point that the Pentagon stopped reporting how many troops they had put into the illegal occupation of Syrian territory. With Lindsey Graham and National Security Adviser Bolton jetting off to meet with Israel and then off to Turkey, one has to wonder what this Jewish government in Washington is up to, other than treason? The US government shut down continues, with some 800K workers furloughed. Trump continues to put a positive spin on how patriotic and wonderful these Americans are, but one has to wonder if it is not time to simply begin the purge that the United States needs. After all, it is no secret that far too many employees working in the US federal government are working against the interests of the United States and her people. A purge is needed, and what better pretext than the very real fact that there is simply no money to pay for these employees. The ongoing arrogance of the Speaker of the House Pelosi unilaterally denying the American people the ability to hear the President of the United States speak before the nation about the State of the United States speaks of a massive abuse, to a near dictatorial nature of the “left” and Jewish power in America. In the third hour, we had a great interview with a Swedish citizen journalist, Fabian Fjälling, whose group, Investigation Sweden, was shut down by the the Swedish government. Investigation Sweden was one of the more successful organizations addressing the Jewish problem and doing so in a way that was able to cut through the clutter and speak directly to the Swedish people.